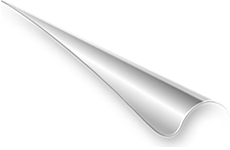 Quick-n-EZ Language Inc. | Blog Page for Quick-n-EZ Language Inc.
Hello again! We hope you all enjoyed the Fourth of July holiday! We’ve had a very busy season ourselves, full of new summer offers just for you as well as getting ready to exhibit at the 15th Bruhan Maharashtra Mandal (BMM) of North America Convention that will be held at the Hyatt Regency McCormick Place in Chicago from July 21- July 24! Maximize your language learning this summer with a 50% discount off of any Quick-n-EZ Language product that is only available until August 31, 2011 by using the following coupon code: WPQHEQBX. Also, if you haven’t already subscribed to Quick-n-EZ’s interactive online learning platform, register before July 21, 2011 to receive one (1) free year of e_learning services (equal to $48 value)! Don’t forget to pass this special offer on to your friends so they join in on the fun of learning the Marathi and Hindi languages! Also this month, our team heads to Chicago for the 15th Bruhan Maharashtra Mandal Convention! This event is held every other year in either the United States or Canada to help promote and nurture the Marathi culture. This convention’s mission goes hand in hand with ours- to help educate people in the Marathi and Hindi cultures and languages – and we’re very excited to be a part of it! The Quick-n-EZ booth and a presentation will allow for convention attendees to learn more about the Quick-n-EZ Language™ system and its products. The presentation will showcase the products and testimonials explaining how easy it is to learn by the proven skill-building approach based in local language references that starts with mastery of letters to build words then simple sentences, and progresses to more complex sentences. During the convention, attendees will also have the chance to win some Quick-n-EZ products including one Alphabet Laminated Chart, and two Smart Charts will be raffled off each day along with one entire package of products to a lucky convention attendee. (How great, right?) We’ll be stationed at booth J4 in the main exposition hall (Hall D) throughout the convention so be sure to come by and visit if you’ll be in the Chicago area! Visit www.quick-n-ez.com today to browse our latest products and receive your special summer discount! Best regards and happy learning. Tatya Tope’s original name was Ram Chandra Pandurang Tope. One of the great Indian freedom fighters, the name of Tatya Tope literally made British generals tremble with fear. He had such an aura with a fearsome reputation. His father, Padurang Rao Tope was a key noble at the court of Maratha Peshwa Baji Rao 2nd. Later on when his family shifted from Peshwa to Bithur, Tatya Tope developed friendships with Peshwa’s adopted sons, Nana Sahib and Maharaja Madhav Singhji. When Lord Dalhousie deprived Nana Sahib of his father’s pension in the year 1851, Tatya took his first action against the British. He was completely against the unjust policies of the British rule. In May 1857, he devoted himself fully to the nation’s cause. He managed to establish his authority and also became the commander in chief of his forces as well as a pivotal figure in India’s freedom war in 1857. He was one of the most wanted freedom fighters by the British army because he had taken over the Indian troops of the East India Company stationed at Kanpur. The British Empire would use force and deception to capture everything India had by depriving Indians of their own rights. Along with other Indians, Tatya Tope also felt great discontentment against the rulers and decided to take his own actions. Tatya Tope joined Rani Laxmibai in Kalpi and to occupy Gwalior, but they lost the battle and Rani Laxmibai was killed. The British managed to occupy Gwalior, but Tatya was not to lose hope. He continued to recruit soldiers and increase his forces and kept fighting the British. During this time, he won many crucial battles and captured forts. It is said that, Tatya Tope fought no less than 150 battles. He kept hurting the British rule with his Guerrilla campaigns. Although the British forces were unable to capture him, he was betrayed by his own friend Man Singh and on April 7, 1859, a British General captured Tatya Tope. He was hanged to death on April 18, 1859. Tatya Tope’s fierce patriotism will always be remembered by the Indian people. Rabindranath Tagore was born in Calcutta, India into a wealthy Brahmin family. After a brief stay in England (1878) to attempt to study law, he returned to India, and instead pursued a career as a writer, playwright, songwriter, poet, philosopher and educator. During the first 51 years of his life he achieved some success in the Calcutta area of India where he was born and raised with his many stories, songs and plays. His short stories were published monthly in a friend’s magazine and he even played the lead role in a few of the public performances of his plays. Otherwise, he was little known outside of the Calcutta area, and not known at all outside of India. This all suddenly changed in 1912. He then returned to England for the first time since his failed attempt at law school as a teenager. Now a man of 51, his was accompanied by his son. On the way over to England he began translating, for the first time, his latest selections of poems, Gitanjali, into English. Almost all of his work prior to that time had been written in his native tongue of Bengali. He decided to do this just to have something to do, with no expectation at all that his first time translation efforts would be any good. He made the handwritten translations in a little notebook he carried around with him and worked on during the long sea voyage from India. Upon arrival, his son left his father’s brief case with this notebook in the London subway. Fortunately, an honest person turned in the briefcase and it was recovered the next day. 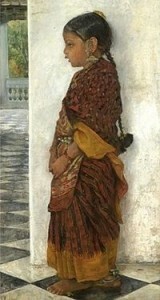 Tagore’s one friend in England, a famous artist he had met in India, Rothenstein, learned of the translation, and asked to see it. Reluctantly, with much persuasion, Tagore let him have the notebook. The painter could not believe his eyes. The poems were incredible. He called his friend, W.B. Yeats, and finally talked Yeats into looking at the hand scrawled notebook. In 1913, Rabindranath received the Nobel Prize for literature. He was the first non-westerner to be so honored. In 1915, he was knighted by the British King George V. When not traveling he remained at his family home outside of Calcutta, where he remained very active as a literary, spiritual and social-political force. In 1919, following the Amritsar massacre of 400 Indian demonstrators by British troops, Sir Tagore renounced his Knighthood. Although a good friend of Mohandas Karamchand Gandhi, most of the time Tagore stayed out of politics, since he was opposed to nationalism and militarism as a matter of principle, and instead promoted spiritual values and the creation of a new world culture founded in multi-culturalism, diversity and tolerance. He served as a spiritual and creative beacon to his countrymen, and indeed, the whole world. He used the funds from his writing and lecturing to expand upon the school he had founded in 1901 now known as Visva Bharati. The alternative to the poor system of education imposed by the British combined the best of traditional Hindu education with Western ideals. Tagore’s multi-cultural educational efforts were an inspiration to many, including his friend, Count Hermann Keyserling of Estonia. Count Keyserling founded his own school in 1920 patterned upon Tagore’s school, and the ancient universities which existed in Northern India under Buddhist rule over 2,000 years ago under the name School of Wisdom. Rabindranath Tagore led the opening program of the School of Wisdom in 1920, and participated in several of its programs thereafter. Maulana Abul Kalam Azad ranks among the top builders of modern India and among the top freedom fighters, who dedicated his entire life to liberate India from the British colonial rule. 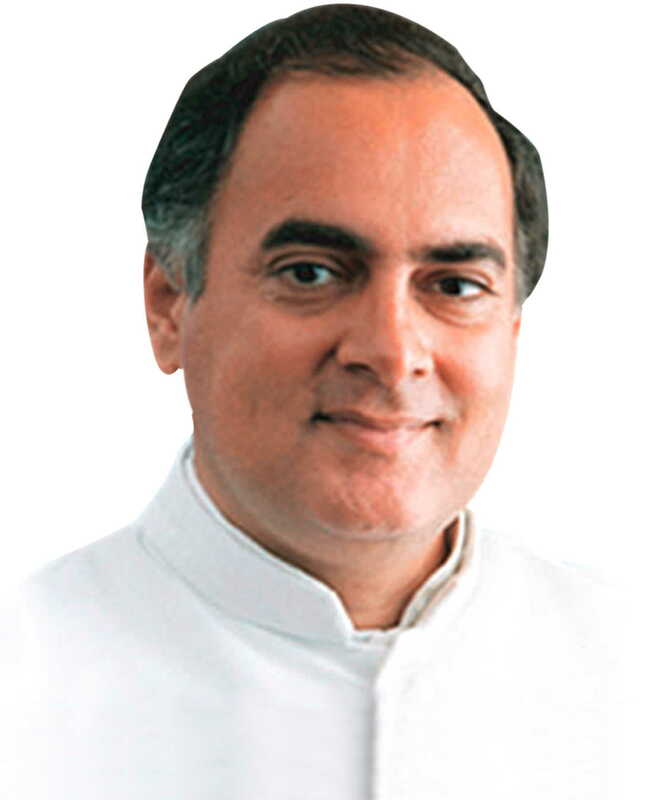 Much has been written about this prince among Indians of his century. He was not only enlightened, erudite, wise and humble, he was also a man who often led from the front and set personal examples for others. Started a weekly journal Al Hilal to increase the revolutionary recruits amongst the Muslims; elected as Congress President in 1923 and 1940; became independent India’s first education minister. Maulana Abul Kalam Azad’s real name was Abul Kalam Ghulam Muhiyuddin. He was popularly known as Maulana Azad. Maulana Abul Kalam Azad was one of the foremost leaders of Indian freedom struggle. He was also a renowned scholar, and poet. Maulana Azad was well versed in many languages viz. Arabic, English, Urdu, Hindi, Persian and Bengali. Maulana Azad was a brilliant debater, as indicated by his name, Abul Kalam, which literally means “lord of dialogue”. He adopted the pen name ‘Azad’ as a mark of his mental emancipation from a narrow view of religion and life. 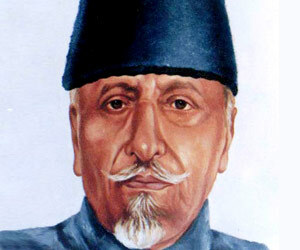 Maulana Azad became independent India’s first education minister. For his invaluable contribution to the nation, Maulana Abul Kalam Azad was posthumously awarded India’s highest civilian honour, Bharat Ratna in 1992. Maulana Abul Kalam Azad was born on November 11, 1888 in Mecca. His forefather’s came from Herat (a city in Afghanistan) in Babar’s days. Azad was a descendent of a lineage of learned Muslim scholars, or maulanas. His mother was an Arab and the daughter of Sheikh Mohammad Zaher Watri and his father, Maulana Khairuddin, was a Bengali Muslim of Afghan origins. Khairuddin left India during the Sepoy Mutiny and proceeded to Mecca and settled there. He came back to Calcutta with his family in 1890. Because of his orthodox family background Azad had to pursue traditional Islamic education. He was taught at home, first by his father and later by appointed teachers who were eminent in their respective fields. Azad learned Arabic and Persian first and then philosophy, geometry, mathematics and algebra. He also learnt English, world history, and politics through self study. Azad was trained and educated to become a clergyman. He wrote many works, reinterpreting the Holy Quran. His erudition led him to repudiate Taqliq or the tradition of conformity and accept the principle of Tajdid or innovation. He developed interest in the pan-Islamic doctrines of Jamaluddin Afghani and the Aligarh thought of Sir Syed Ahmed Khan. Imbued with the pan-Islamic spirit, he visited Afghanistan, Iraq, Egypt, Syria and Turkey. In Iraq he met the exiled revolutionaries who were fighting to establish a constitutional government in Iran. In Egypt he met Shaikh Muhammad Abduh and Saeed Pasha and other revolutionary activists of the Arab world. He had a first hand knowledge of the ideals and spirit of the Young Turks in Constantinople. All these contacts metamorphosed him into a nationalist revolutionary. On his return from abroad, Azad met two leading revolutionaries of Bengal- Aurobindo Ghosh and Sri Shyam Shundar Chakravarty,-and joined the revolutionary movement against British rule. Azad found that the revolutionary activities were restricted to Bengal and Bihar. Within two years, Maulana Abul Kalam Azad, helped setup secret revolutionary centers all over north India and Bombay. During that time most of his revolutionaries were anti-Muslim because they felt that the British Government was using the Muslim community against India’s freedom struggle. Maulana Abul Kalam Azad tried to convince his colleagues to shed their hostility towards Muslims. In 1912, Maulana Abul Kalam Azad started a weekly journal in Urdu called Al Hilal to increase the revolutionary recruits amongst the Muslims. Al-Hilal played an important role in forging Hindu-Muslim unity after the bad blood created between the two communities in the aftermath of Morley-Minto reforms. Al Hilal became a revolutionary mouthpiece ventilating extremist views. The government regarded Al Hilal as propogator of secessionist views and banned it in 1914. Maulana Azad then started another weekly called Al-Balagh with the same mission of propagating Indian nationalism and revolutionary ideas based on Hindu-Muslim unity. In 1916, the government banned this paper too and expelled Maulana Abul Kalam Azad from Calcutta and interned him at Ranchi from where he was released after the First World War in 1920. After his release, Azad roused the Muslim community through the Khilafat Movement. The aim of the movement was to re-instate the Khalifa as the head of British captured Turkey. Maulana Azad supported Non-Cooperation Movement started by Gandhiji and entered Indian National Congress in 1920. He was elected as the president of the special session of the Congress in Delhi (1923). Maulana Azad was again arrested in 1930 for violation of the salt laws as part of Gandhiji’s Salt Satyagraha. He was put in Meerut jail for a year and a half. Maulana Azad became the president of Congress in 1940 (Ramgarh) and remained in the post till 1946. He was a staunch opponent of partition and supported a confederation of autonomous provinces with their own constitutions but common defence and economy. Partition hurt him greatly and shattered his dream of an unified nation where Hindus and Muslims can co-exist and prosper together. Maulana Abul Kalam Azad served as the Minister of Education in Pandit Jawaharlal Nehru’s cabinet from 1947 to 1958. He died of a stroke on February 22, 1958. 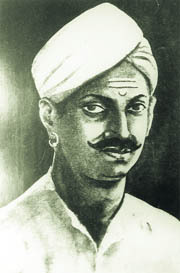 Mangal Pandey was a soldier in the 34th Regiment of the Bengal Native Infantry (BNI) of the English East India Company. He is widely seen in India as one of its first freedom fighters. The Indian government has issued postage stamps commemorating him as a freedom fighter and his life and actions have been adapted to the silver screen. The primary motivation behind Mangal Pandey’s behavior is attributed to a new type of bullet cartridge used in the Enfield P-53 rifle which was to be introduced in the Bengal Army that year. At Barrackpore on March 29, 1857, in the afternoon, Lieutenant Baugh, Adjutant of the 34th Bengal Native Infantry (BNI), was informed that several men of his regiment were in an excited state. Further, it was reported to him that one of them, Mangal Pandey, was pacing in front of the regiment’s guard room by the parade ground, armed with a loaded musket, calling upon the men to rebel and threatening to shoot the first European he set his eyes on. Baugh immediately buckled on his sword, placed loaded pistols in his holsters, mounted his horse, and galloped to the lines. Pandey, who heard the hoof-beat of the approaching horse, took position behind the station gun, which was in front of the quarter-guard of the 34th, took aim at Baugh and fired. He missed Baugh, but the bullet struck his horse in the flank, and both horse and rider were brought down. Baugh quickly disentangled himself, and, seizing one of his pistols, advanced towards Pandey and fired. He missed. Before Baugh could draw his sword, Pandey attacked him with a talwar (an Indian heavy sword) and closing with the adjutant, slashed him on the shoulder and neck and brought him to the ground. It was then that another soldier (sepoy), Shaikh Paltu, intervened and tried to restrain Pandey even as he tried to reload his musket. 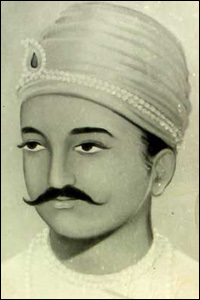 The primary motivation behind Mangal Pandey’s behaviour is attributed to a new type of bullet cartridge used in the Enfield P-53 rifle which was to be introduced in the Bengal Army in 1857. The cartridge was rumored to have been greased with animal fat, primarily from pigs and cows, which could not be consumed by Muslims and Hindus respectively (the former being abhorrent to Muslims and the latter a holy animal of the Hindus). The cartridges had to be bitten at one end prior to use. The Indian troops were of the opinion that this was an intentional act of the British, with the aim of defiling their religions. Lala Lajpat Rai was an Indian author, freedom fighter and politician who were chiefly remembered as a leader in the Indian fight for freedom from the British Raj. He was popularly known as Punjab Kesari (The Lion of Punjab). Lala Lajpat Rai was born on January 28, 1865 in village Dhudike, in present day Moga district of Punjab. He was the eldest son of Munshi Radha Kishan Azad and Gulab Devi. His father was an Aggarwal Bania by caste. His mother inculcated strong moral values in him. 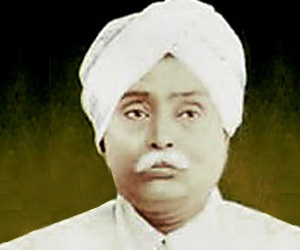 Lala Lajpat Rai was one of the three most prominent Hindu Nationalist members of the Indian National Congress. He was part of the Lal-Bal-Pal trio. The other two members of the trio were Bal Gangadhar Tilak and Bipin Chandra Pal. They formed the extremist faction of the Indian National Congress, as opposed to the moderate one led first by Gopal Krishna Gokhale. Lalaji actively participated in the struggle against partition of Bengal. Along with Surendra Nath Banerjee, Bipin Chandra Pal and Aurorbindo Ghosh, he galvanized Bengal and the nation in a vigorous campaign of Swadeshi. Lalaji was arrested on May 3, 1907 for creating “turmoil” in Rawalpindi. He was put in Mandalay jail for six months and was released on November 11, 1907. In 1928, British Government decided to send Simon Commission to India to discuss constitutional reforms. The Commission had no Indian member. 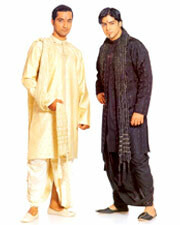 This greatly angered Indians. In 1929, when the Commisssion came to India there were protests all over India. Lala Lajpat Rai himself led one such procession against Simon Commission. While the procession was peaceful, British Government brutally lathicharged the procession. Lala Lajpat Rai received severe head injuries and died on November17, 1928. 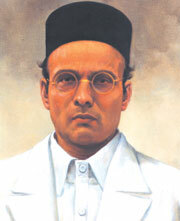 Savarkar’s revolutionary activities began when studying in India and England, where he was associated with the India House and founded student societies including Abhinav Bharat Society and the Free India Society, as well as publications espousing the cause of complete Indian independence by revolutionary means. Savarkar published The Indian War of Independence about the Indian rebellion of 1857 that was banned by British authorities. He was arrested in 1910 for his connections with the revolutionary group India House. Following a failed attempt to escape while being transported from Marseilles, Savarkar was sentenced to two life terms amounting to 50 years’ imprisonment and moved to the Cellular Jail in the Andaman and Nicobar Islands. While in jail, Savarkar wrote the work describing Hindutva, openly espousing Hindu nationalism. He was released in 1921 under restrictions after signing a plea for clemency in which he renounced revolutionary activities. Travelling widely, Savarkar became a forceful orator and writer, advocating Hindu political and social unity. Serving as the president of the Hindu Mahasabha, Savarkar endorsed the ideal of India as a Hindu Rashtra and opposed the Quit India struggle in 1942, calling it a “Quit India but keep your army” movement. He became a fierce critic of the Indian National Congress and its acceptance of India’s partition, and was one of those accused in the assassination of Indian leader Mohandas Karamchand Gandhi. He was acquitted as the charges could not be proven. 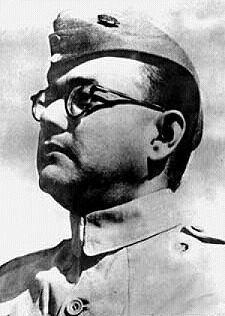 Subhas Chandra Bose generally known as Netaji (literally, “Respected Leader”), was one of the most prominent and highly respected leaders of the Indian independence movement against the British Raj. Bose was elected president of the Indian National Congress for two consecutive terms but resigned from the post following ideological conflicts with Mahatma Gandhi. Bose believed that Gandhi’s tactics of non-violence would never be sufficient to secure India’s independence, and advocated violent resistance. He established a separate political party, the All India Forward Bloc and continued to call for the full and immediate independence of India from British rule. He was imprisoned by the British authorities eleven times. His stance did not change with the outbreak of the Second World War, which he saw as an opportunity to take advantage of British weakness. At the outset of the war, he fled from India and traveled to the Soviet Union, Germany and Japan, seeking an alliance with the aim of attacking the British in India. With Japanese assistance, he re-organized and later led the Indian National Army, formed from Indian prisoners-of-war and plantation workers from Malaya, Singapore and other parts of Southeast Asia, against British forces. With Japanese monetary, political, diplomatic and military assistance, he formed the Azad Hind Government in exile and regrouped and led the Indian National Army in battle against the allies at Imphal and in Burma. His political views and the alliances he made with Nazi and other militarist regimes at war with Britain have been the cause of arguments among historians and politicians. Some have accused him of Fascist sympathies, while others in India have been more sympathetic towards the realpolitik that guided his social and political choices. He is believed to have died on August 18, 1945, in a plane crash over Taiwan. However, contradictory evidence exists regarding his death in the accident. His legacy rests alongside those of many men and women who resorted to arms in the anti-colonial struggles of the twentieth century. The desire for freedom is strong among people and self-determination is a recognized political right. The colonial powers did not hesitate to use violence to suppress independence movements. The British in India, even in response to non-violent protest, arrested and imprisoned people which represented a type of violence. Rightly or wrongly, Bose and many others have turned to war to claim their freedom, so strong is the human desire to live in states that control their own destiny. He was far from being a selfish man or a man who spent his life aspiring to personal ambitions. Rather, in the way he thought appropriate, he strove to free his nation from colonial rule. Quick-n-EZ™ | 5550 Sterrett Place, Suite 311,Columbia,MD 21044 | Phone: 1-(410)-730-0667 Copyright ©2011 Quick-n-EZ™. All Rights Reserved.